For patients with minor dental decay, a filling can restore and seal your tooth to help prevent further damage. Drs. David C. MacKay and Christopher DeMille perform tooth filling treatments at our practice in West Valley City, UT, and are able to address multiple decayed teeth in a single visit. This procedure reinforces the strength of your smile and can help to prolong your oral health. As cavities are not always readily apparent, it is important to schedule regular dental checkups. During a dental exam, our experienced hygienists can detect signs of dental decay in their earliest stages, helping to protect you from serious complications like tooth loss. A cavity is a small hole that forms in the tooth surface. Minor decay affects the two outer layers of the tooth, known as enamel and dentin. As a cavity progresses, it can spread to deeper areas of the tooth, such as the pulp or nerves. Deep cavities may require root canal therapy or a dental crown to restore shape and function. Several factors can leave teeth vulnerable to decay. Tooth enamel can become worn down from constant teeth grinding or a misaligned bite. In addition, the foods we eat can wear away at the surface of our teeth. Lastly, patients who do not follow proper oral hygiene practices will often develop cavities. If detected early, most cavities can be treated with a simple dental filling. During your consultation, our team can examine your oral health and the structure of your smile to determine the appropriate treatment for your needs. 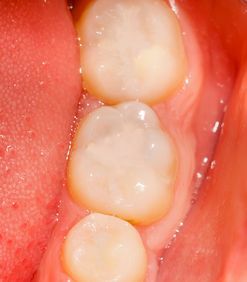 If decay is too extensive for a filling but does not warrant a dental crown, we can provide you with an inlay or onlay. To ensure your comfort during a dental filling procedure, we will administer a local anesthetic to numb your teeth and gums. Once you are ready, we will isolate the affected tooth with a rubber dam. Your dentist will then remove any sections of decay and thoroughly clean your tooth in preparation for filling. Next, we will carefully fill the cavity with a composite resin or metal material. If you choose composite resin, we can carefully match the shade of your filling to blend seamlessly with your smile for natural-looking results. Dental fillings restore strength and shape to the tooth structure, helping patients to regain full dental function. They also eliminate any pain or discomfort caused by a cavity. As fillings seal your tooth, these restorations can prevent the spread of decay, prolonging your oral health. This procedure reinforces the strength of your smile and can help to prolong your oral health. Dental fillings are long-lasting restorations, with a lifespan of up to 15 years. In addition, they are almost always covered by dental insurance plans, so budgetary concerns should not interfere with your treatment. In addition to placing new fillings, we can also replace old, worn dental work that is damaged or unsightly. If you are experiencing any pain or dental sensitivity in one or more teeth, you may have a cavity. Contact our office online or call us at (801) 397-5262 to schedule an appointment and find out if a dental filing is right for you.